Scores of Libyan soldiers have been executed for refusing to open fire on pro-democracy protesters, International Federation for Human Rights (IFHR) says. An amateur video shows the bodies of some 130 slain soldiers with their hands tied behind their backs. 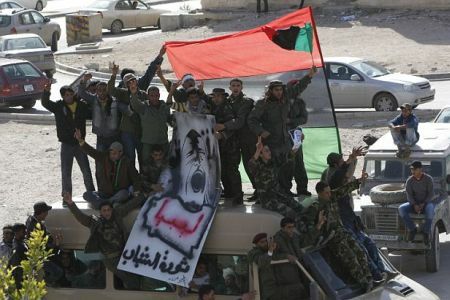 The mutinous soldiers were shot dead in al-Baida near the eastern city of Benghazi. This comes amid more reports of defiance among army ranks and soldiers who have refused to obey orders by embattled Libyan ruler Muammar Gaddafi to shoot peaceful protesters. The IFHR said the brutal crackdown on protesters in Libya is “crime against humanity has to be referred to the International Court of Justice,” dpa reported on Wednesday. Medical sources told the rights group that they have seen scenes of carnage in Benghazi, where hospitals remain packed with dead bodies and people injured in attacks by Gaddafi loyalists. Meanwhile, hundreds of dead protesters have been buried in mass graves at a beach in the capital Tripoli, reports said. At least 1,000 people have reportedly lost their lives in the security forces’ crackdown on civilians since last week, while Gaddafi has vowed not to bow to popular calls to end his four-decade rule, and threatened to crush the pro-democracy protesters. Security forces used heavy machine guns on Wednesday to stop crowds of protesters. However, more cities, including Tajuraa, Zwaara, Azzawiya, Benghazi, Derna and Tobruk, are falling out of the control of government forces. Libya has tightened its clampdown by launching a door-to-door search for opposition protesters, reports say. 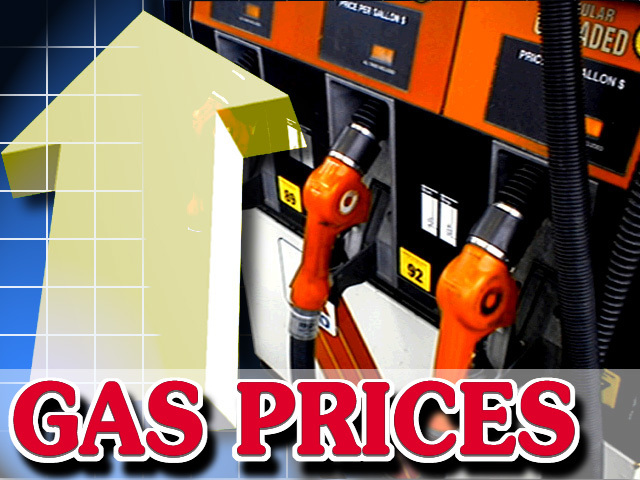 Earlier this week, market analysts warned that the price of gas may reach $5 by the end of summer. Now they are saying we could see that price by Memorial Day as the situation in Libya deteriorates. On the S&P 500 today, the price of Brent Crude breached $119 a barrel during a period of frantic trading. Brent Crude is used to price two thirds of the world’s internationally traded crude oil supplies. The price was below $100 yesterday afternoon. The world’s oil benchmark jumped almost $17 this week and it appears there is no end in sight as the situation in the Middle East heats up. Saudi Arabia is under pressure to boost output as the prospect of a Libya production cutoff looms. Oil traders said Saudi talks with Europe signal that the oil kingdom understands that the political crisis in Libya is now an oil supply crisis. On Thursday, the Italian oil company Eni, the most active company in Libya, said oil production from the North African country has dropped to just a quarter of normal levels. A 20-year-old Saudi student arrested in Texas on suspicion of planning a terrorist attack with explosive chemicals had looked at New York City as a possible target. Khalid Ali-M Aldawsari, attending college near Lubbock, Texas, was charged with attempted use of a weapon of mass destruction. “It is war … until the infidels leave defeated,” the chemical engineering student wrote in online postings. Federal prosecutors said he had researched online how to construct an improvised explosive device using several chemicals as ingredients. Court papers said Aldawsari had been researching New York City, including viewing real-time traffic cameras online that showed the city. MOSCOW – Russian news agencies are citing Defense Ministry officials as saying the country will spend $650 billion to equip its dilapidated military with 600 new warplanes, 100 ships and 1,000 helicopters by 2020. The agencies quote First Deputy Defense Minister Vladimir Popovkin as saying Thursday that the ambitious plan envisages eight new nuclear submarines and two Mistral aircraft carriers in addition to the two that Russian is buying from France. The announcement comes during a large-scale streamlining of personnel in Russia’s bloated and poorly equipped armed forces. The unpopular reforms of Defense Minister Anatoly Serdyukov have seen as many as 200,000 officers lose their jobs and nine of every 10 army units disbanded. RABAT (Reuters) – Two of Morocco’s biggest political parties and human rights groups have joined calls by a youth movement for constitutional reform that could reduce the role of the king. 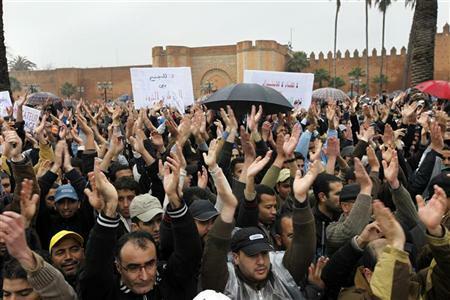 Most Moroccan political parties boycotted a February 20 nationwide protest calling for the adoption of a parliamentary monarchy, the dismissal of the coalition government and the dissolution of parliament. Interior Ministry said 37,000 people took part in the protest while organisers put the number at 300,000. 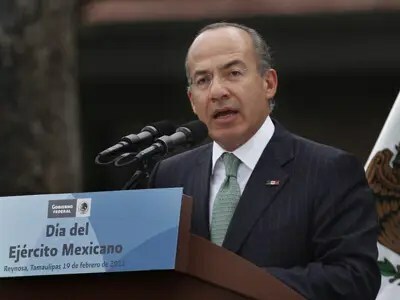 A Mexican army officer assigned to guard President Felipe Calderon leaked military intelligence to drug cartels, trained hit men and supplied military weapons to Los Zetas, according to a U.S. Embassy cable recently released by Wikileaks. The U.S. Embassy cable, dated Jan. 20, 2009, says the case was the most serious security breach during the Calderon presidency and indicates that Mexico’s powerful drug cartels have infiltrated large parts of the security apparatus.